First time trying software out and am trying to follow the color tracking tutorial. What I would like to do is a little simpler I think. I would like to track a round object passing under a stationary camera and determine if its perfectly round first then determine if there are imperfections in its surface. And if either are true send an output to a controller to eject the rejects. These would be parts similar to a 1 inch metal washer. I was hoping someone could tell me what steps I would need to do. I now have the camera (Microsoft LifeCam Studio USB WebCam) setup looking at the object using RGB filter and center of gravity. Rather than us guess at what your image looks like can you post an example? When you say imperfections, what types are they? Surface, shape, color? Now playing with object recognition. WOW how cool. As you can see I would like to sort coins. Playing with recognition it seems I might be able to see tails from heads on the same size coin. 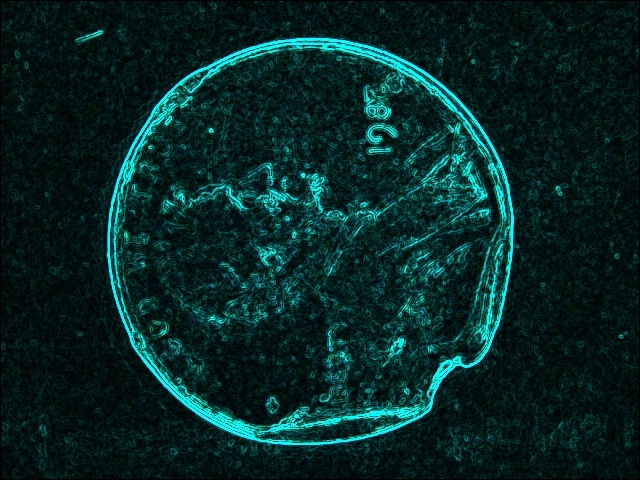 But yes I would like to fine tune it to see a damaged coin or one that is even corroded. Thinking down the line if I can make this work how fast could I recognize and reject unwanted coins. Would I need a better camera? Robo so far. Thinking There are a lot of other bells and whistles I can add but until I play with everything Just have no idea what does what. and specifically the Axial Lighting which would be required for coin identification. Can you try to get that lighting setup and post some images here? Things will work MUCH better given that lighting setup. Ok axial lighting setup. I have some lights setup on track lighting or table top spots. Just a brief statement about lighting or forevermore called "ILLUMINATION". You should read some scientific articles about even illumination. Don't try to use one specific source of lighting. Just the type of bulb you use will affect the image. There are light sources of many different types such as LED, flourescent, incandecant, and natural light to mention some. All have degrees for the perfect flaw you are looking for. For starters see CIE l*a*b color space. See Hunter Labs for more information about color spacing and the wonderful world of color. This will most definately give you some degree on using lighting techniques and the importance. However, using webcams and the sort, true values can only be approxiamate. You will need to get a decent camera and obtain the values of the red green blue values and use them to your advantage. I can't stress the importance of illumination especially even and uniform illumination with the correct source for the camera. "I see" said the grasshopper. Yes there is a lot of info on this. Lighting #1. I picture a small conveyor with coins moving at a good rate under the camera. Ordered a new light. Should work better. ANy ideas on a better camera for motion and detail? The basic rule with cameras is the better the camera the more expensive it is! But what level you need will really depend on what you are doing. Most of the really high machine vision cameras produce very crisp edges which are very good for quantification of size or shape. Certainly if you can get one of those from XIMEA or Imaging Source they are definitely better than webcams. If those are out of budget try one of the HD versions of Logitech or Microsoft which are typically quite good. As you can see in this picture if the box does not catch the cut in the coin on the right quadrent it will have a high confidence number. You can use the Canny module (to get outline) followed by the Circle module to detect circles. But if you include the images that you've been getting here we can make a better suggestion perhaps with the OR module too.